Mandrake Root is a strong, powerful purgative that has historically been used to regulate bowel and liver function. As a colon cleanser, the herb is believed to be a strong stimulant that efficiently cleanses and removes waste products from the body and has been used to treat constipation, jaundice and other disorders associated with waste product buildup. Native Americans used it to remove warts externally and to expel worms from the intestines when used internally. It has also been found to be effective topically for genital warts.The herb has also been used in the treatment of cancer, varicose veins, and ulcers. Though it is considered to be an effective herbal medicine, it is a very potent one and sometimes narcotic, therefore it should only be taken with extreme care. Mandrake root extract is considered to be an excellent regulator of the bowels and liver. In chronic liver disease, it is believed to have no equal. It is thought to be valuable in jaundice and intermittent fever. Mandrake is also considered a vermifuge, an agent that destroys and expels worms from the intestinal tract. Mandrake, sometimes called May-apple, is used to stimulate bile flow, as well as aid in digestion and eliminating obstructions in the bowel. North American and Asian May-apple contain anti-cancer agents and can act powerfully on all tissues of the body. Recent studies have shown some promising results for its use as a possible treatment for several malignant diseases and malignant growths. In tests, it has been found to stimulate the immune system while suppressing lymph cells and appears to be more toxic to leukemia cells than normal cells. Mandrake Root, used externally, is said to be effective in wart removal, especially helping genital, or venereal warts, as the root is said to possess strong antiviral properties. Ingredients: American Mandrake, Structured Water, 20% Alcohol. Non-alcohol: American Mandrake, Structured Water, Vegetable Glycerin. Contraindications: Pregnant and nursing women should never use Mandrake Root. It is an extremely potent herb and should be used with great caution (it is always advisable to use it in consultation with a physician), and it is subject to restrictions in many countries. It should never be taken in large amounts, as an overdose would likely be fatal. It is considered unsafe as a food by the USFDA. 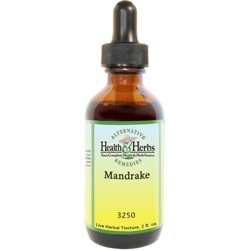 Stop taking Mandrake if you experience shortness of breath, nausea, muscle weakness, low blood pressure and fast heart rate. This may be a sign of poisoning. See your doctor right away if you have confusion, dizziness, hallucinations, shaking), ataxia (problems with walking) or loss of consciousness.